These Reese's stuffed chocolate chip cookies combine two favorite treats into one decadent cookie! If you're ever wondering how to make a dessert better, adding some Reese's candies is a pretty safe bet. 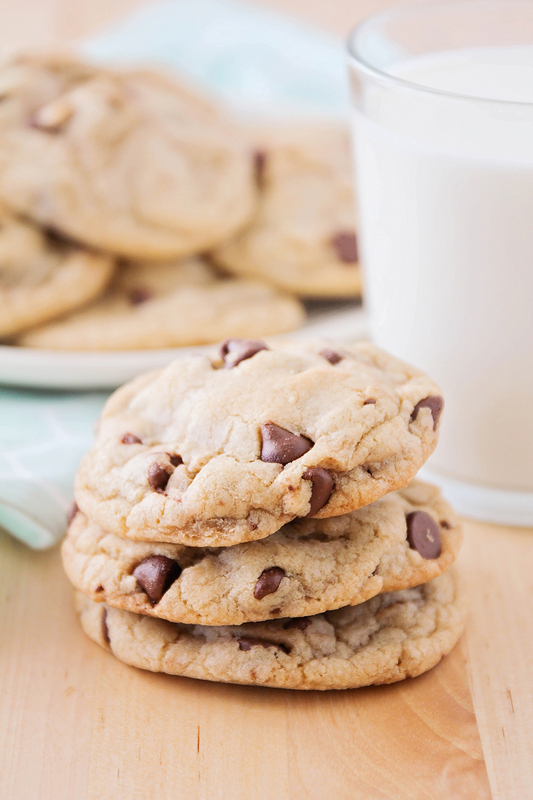 It certainly worked for these chocolate chip cookies! 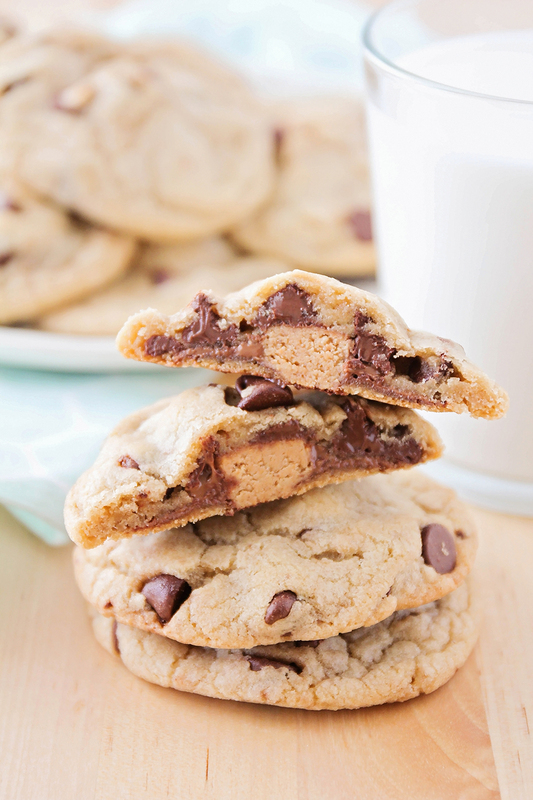 Seriously, though, who can resist a warm, soft, chewy chocolate chip cookie, stuffed with a melty Reese's mini? Not me, that's for sure! I made these cookies a few weeks ago when I found a forgotten bag of Reese's minis on the top shelf of the cupboard, behind some mixing bowls. I'm honestly shocked that a forgotten bag of Reese's could even exist in my house, since my kids seem to have an extrasensory ability to find candy, wherever it is hidden. I knew that if I brought the bag of candy down and placed it in one of my usual hiding places, the kids would find it and demolish it within a day or so. I decided the best solution was to bake something with it instead! 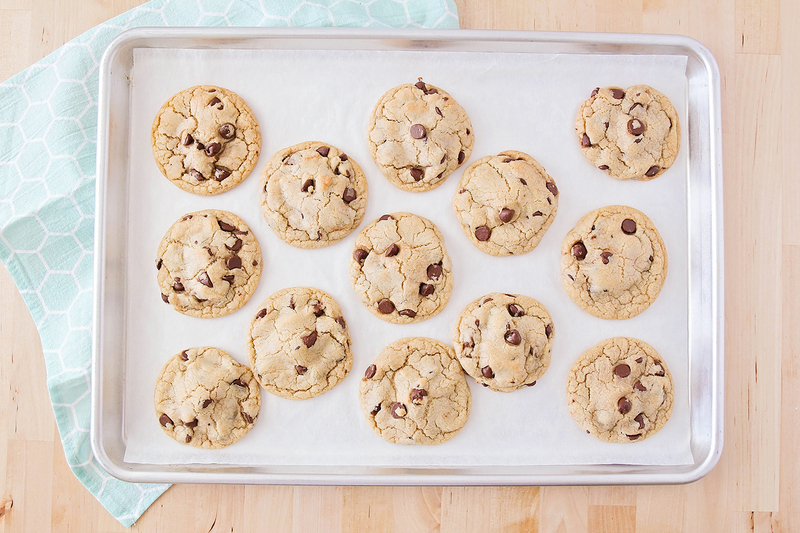 Chocolate chip cookies are always quick and easy to make, and adding the Reese's just makes them all the more delicious. Be careful to seal the dough all the way around the candy, to prevent the candy from leaking out the bottom of the dough as they bake. The Reese's chocolate gets very melty and kind of spreads within the cookie, and you don't want to lose any of that deliciousness to the baking sheet. Preheat the oven to 350. Line two baking sheets with parchment or silicone liners and set aside. In a large bowl or the bowl of a stand mixer, mix together the butter, brown sugar, and sugar. Add the egg, egg yolk, and vanilla, and mix until combined. Add the flour, baking powder, and salt, and mix to form a soft dough. Gently fold in the chocolate chips. 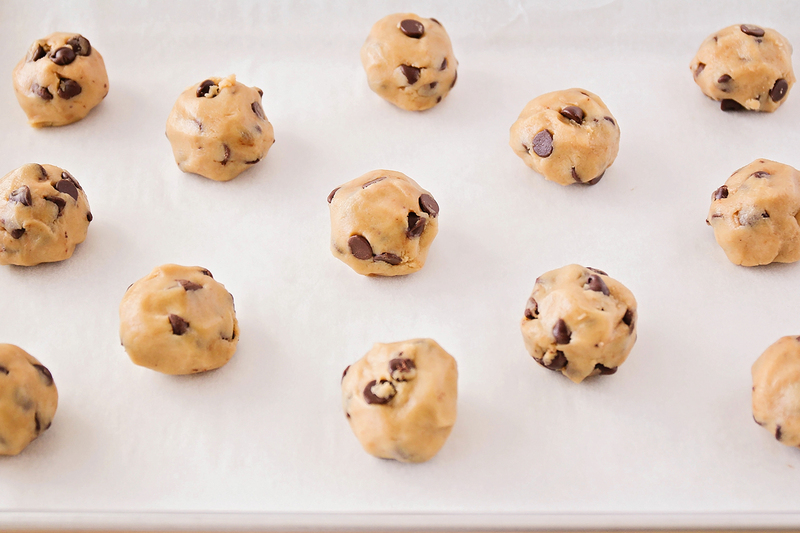 Roll the cookie dough into golf ball sized balls. 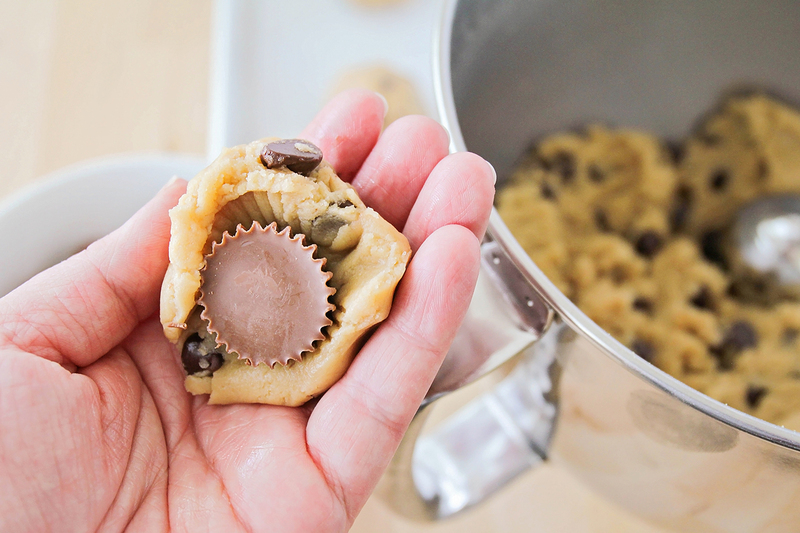 Flatten each ball slightly, then place a Reese's mini in the middle of the dough. Wrap the dough around the candy, sealing it closed. Place seam side down on the prepared baking sheet. Bake 11-13 minutes, or until the bottoms are lightly golden brown.